The fight against climate change in the U.S. is being led by cities. On California’s Central Coast, the fight took a historic turn in September when the City of San Luis Obispo voted unanimously to achieve a net zero carbon footprint by 2035, the most ambitious goal in the nation! The SLO Climate Coalition and the City of San Luis Obispo have teamed up to host the Climate Solution Series, a number of events created to engage the community in understanding our newClimate Action Plan and how we can work together to achieve carbon neutrality for San Luis Obispo by 2035. 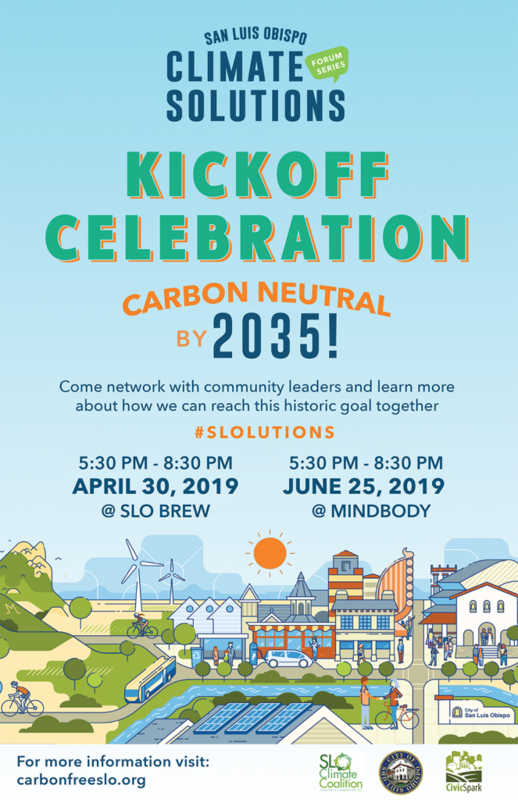 On April 30 2019, the Kickoff Celebration will bring together important San Luis Obispo community leaders and nonprofits who will be key players in fulfilling the plan to achieve our aggressive community-wide goals. Join us for a fun evening of food, prizes, and climate solutions! Come network with community leaders and learn more about how TOGETHER, WE WILL REACH THIS HISTORIC GOAL!